WEST LAFAYETTE, Ind. 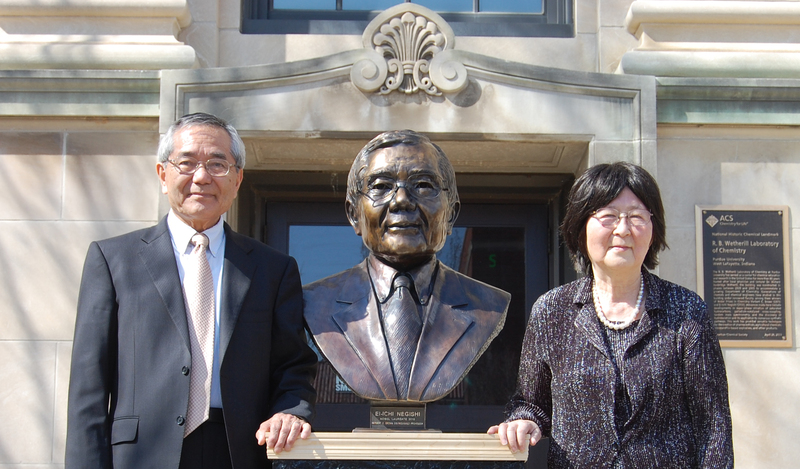 — Purdue University unveiled a sculpture of Nobel laureate and professor Ei-ichi Negishi during a ceremony at 4 p.m. Friday (April 18) on the south steps of the Wetherill Laboratory of Chemistry. The bronze bust was created by sculptor Rita Hadley and her husband, Rick, who also created The Block P sculpture in Academy Park, north of Stewart Center. The bust will join that of the late Herbert C. Brown, Negishi's mentor and Purdue's first Nobel Prize winner, in permanent display inside the Wetherill Laboratory of Chemistry. "My memories of working with Dr. Negishi on campus and celebrating with him when he received the Nobel Prize in Stockholm will be with me for the rest of my life," said Jeffrey Roberts, the Frederick L. Hovde Dean of the College of Science. "The work of art we are unveiling will be a powerful reminder to future generations of students, faculty and staff of Dr. Negishi’s everlasting impact on his university, on chemistry and on humanity." Speakers at the unveiling ceremony included Roberts; Timothy Zwier, the head of the Department of Chemistry and M.G. Mellon Distinguished Professor of Chemistry; Masaharu Yoshida, the Consul General of Japan at Chicago; and Negishi. The artists also were in attendance. "The chemistry department at Purdue has a long tradition of excellence in synthetic organic chemistry, most visibly recognized by the two Nobel Prizes that have been awarded to our faculty, first with H.C. Brown, and in 2010 with Ei-ichi Negishi," Zwier said. "This occasion of the unveiling of a bust of Dr. Negishi provides us with another opportunity to celebrate this amazing achievement, and more generally to celebrate this signature area of synthetic organic chemistry within our department." Negishi, the Herbert C. Brown Distinguished Professor and Teijin Limited Director of the Negishi-Brown Institute, won the 2010 Nobel Prize in chemistry for his palladium-catalyzed cross coupling technique to link carbon atoms. It is estimated that at least 25 percent of all chemical reactions in the pharmaceutical industry use the technique. The so-called "Negishi coupling" also has been used in fluorescent marking essential for DNA sequencing and in the creation of materials for thin LED displays. He shared the Nobel Prize with Richard Heck and Akira Suzuki. Negishi currently serves as the inaugural director of Purdue's Negishi-Brown Institute, which supports basic research in catalytic organometallic chemistry through graduate and postdoctoral fellowships, regular workshops and symposia, and relationships with industrial partners. Negishi grew up in Japan and received a bachelor's degree in organic chemistry from the University of Tokyo in 1958. He moved to the United States in 1960 to attend graduate school at the University of Pennsylvania as a Fulbright-Smith-Mundt scholar, earning a doctorate in organic chemistry in 1963. Negishi came to Purdue in 1966 as a postdoctoral researcher under Brown, who won the Nobel Prize in 1979. Negishi went to Syracuse University in 1972, where he was an assistant professor and then an associate professor before returning to Purdue in 1979. He was appointed the H.C. Brown Distinguished Professor of Chemistry in 1999 and has won various awards, including a Guggenheim Fellowship, the A.R. Day Award, a 1996 Chemical Society of Japan Award, the 1998 American Chemical Society Organometallic Chemistry Award, a 1998 Humboldt Senior Researcher Award and the 2010 American Chemical Society Award for Creative Work in Synthetic Organic Chemistry. He also was given the 2010 Order of Culture, Japan's highest distinction, and named as a Person of Cultural Merit. Negishi has authored more than 400 publications including two books, one of which is the Handbook of Organopalladium Chemistry for Organic Synthesis. Collectively, these publications have been cited more than 20,000 times. The 31st annual Herbert C. Brown Lectures in Organic Chemistry will be Saturday (April 19). Speakers include John Hartwig of the University of California, Berkeley; Stephen F. Martin of the University of Texas; Samuel I. Stupp of Northwestern University; Tim Swager of Massachusetts Institute of Technology; David A. Tirrell of Caltech; and Ronald Zuckermann of the Lawrence Berkeley National Laboratory.